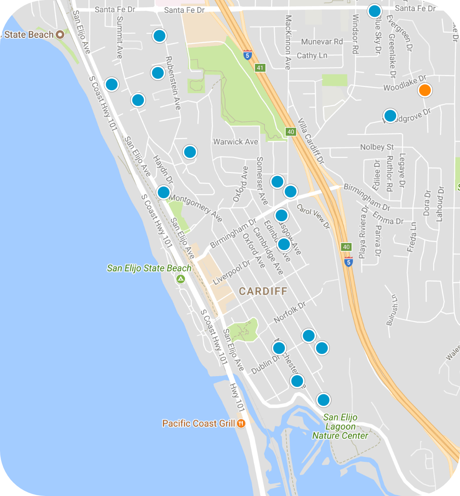 San Diego Home Sales website search offers all Cardiff-by-the-Sea homes, condos and foreclosures for sale. You are able to get new property listings daily that meet your search criteria. Cardiff-by-the-Sea, California, which is usually simply referred to as Cardiff, is a suburban community in the San Diego region of Southern California. It is located between Encinitas and Solana Beach, and has a population of around 12,000. Technically it is a neighborhood within Encinitas, but it is south of the city and has its own Zip code. The Pacific Ocean is the western border of the community, and many of its homes have wonderful ocean views. It is about 25 miles north of downtown San Diego. The community was founded as an agricultural enclave but it began development in 1911 when a man named J. Frank Cullen began to build new homes in the area. Cullen's wife was a native of Cardiff, Wales, and she was the one who convinced him to give the community its name after her hometown. Consequently, many of the area's street names are named after cities in the United Kingdom. Though the community was originally named simply Cardiff, German developer Victor Kramer, who later came to the community, added the "by-the-Sea" to its name. There are two schools in Cardiff run by the Cardiff School District: Cardiff Elementary, which serves grades kindergarten through third grade, and Ada Harris Elementary, which contains grade three through six. For higher-level education, students attend middle and high schools in the San Dieguito Union High School District. The community is very livable, with many of the main attractions easily reached simply by walking. Its beach, lagoon, several restaurants, the post office, library and other spots can all be accessed within minutes of each other by walking. The main area of town for dining is called Restaurant Row and features an assortment of dining options, particularly those serving seafood. Nearby is the San Elijo State Beach Campground, where visitors can spend time on the beach during the day and rent campsites overnight. Glen Park has basketball and tennis courts, and Cardiff Sports Park has baseball and soccer fields for use. Cardiff Reef is a popular destination for surfers all over the region. South of the community if the 900-acre San Elijo Lagoon Ecological Reserve.